Calling all gamers, movie fans and comic fanatics, MCM Comic Con is arriving in Liverpool in March to transform the hall into a huge celebration of pop culture for the very first time and it is not a show to be missed. Bringing the best dealer stalls from all over the UK offering collectibles, Anime and Manga as well as special guests giving you the chance to meet your stars, gaming experts and voice artists and the comic village which is crammed with artists and writers aiming to bring all you creators of all styles together to promote the good word of art. Being the largest and most exciting culture show in the UK and lots of exciting areas to explore including, movies, gaming, comics, anime, television shows, gadget and clothing as well as the comic village, you are sure to have the time of your life not to mention a stunning line up of special guests. 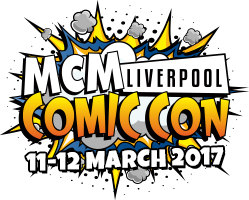 With a huge demand from fans, sponsors and exhibitors for MCM Comic Con to come to Merseyside, it is sure to be a very busy day for everyone involved, especially if you are exhibiting at the event. So why not take advantage of our fantastic promotional staff to step in as if they were a full-time member of staff to ensure your service is as good as possible. Whether you have a sales stand or a dealer stall, our staff will drive footfall to your stand, distribute literature and talk to you customers while they wait to purchase the best collectables in the UK, our staff will be briefed on your collectables which ensures you’ll have the advantage over the top dealers at the show. To enquire about booking our outstanding promotional staff, simply complete our online quote enquiry form or if you would prefer to chat call us on 0844 800 0071.